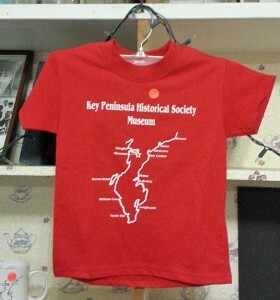 Our museum store offers a variety of books, mugs, t-shirts, maps and family tree charts. 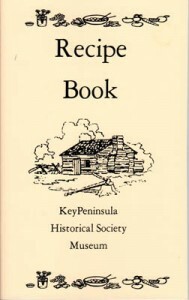 If you are looking gifts while our store is closed, please email us or call 253-884-2511 for a special opening to buy a bit of KP history. 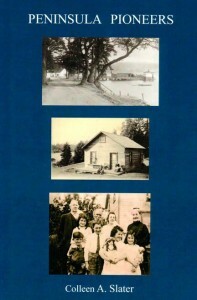 Along the Waterfront A history of the Gig Harbor and Key Peninsula Areas. 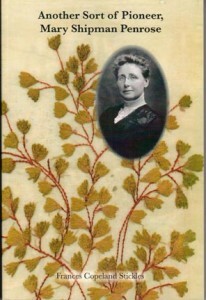 Another Sort of Pioneer "Another Sort of Pioneer" by Frances Copeland Stickles tells the story of a remarkable woman and, through her, reveals a fascinating slice of American history. 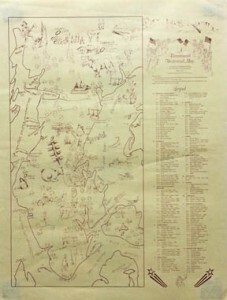 Bicentennial Map Created by the Key Peninsula Historical Society, May 1976. 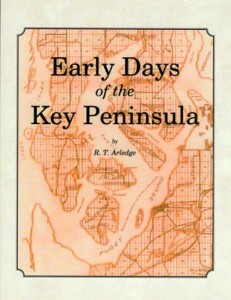 This map was especially prepared to celebrate the early settlers of the Peninsula area and the interesting points of historical value. 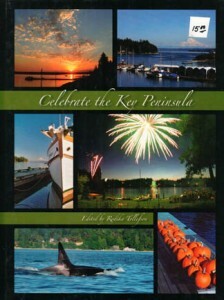 Celebrate the Key Peninsula Partake in the awe-inspiring beauty of the Key Peninsula. See the sights and enjoy the sounds of this unique region and all the diversity of man and nature. Explore tide pools at Penrose Point State Park, admire sunsets over the Olympics, whale-watch in Case Inlet and savor the delicious flavors of the harvest season. 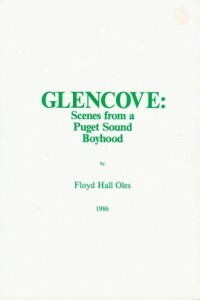 Glencove: Scenes from a Puget Sound Boyhood Memoirs from a youth growing up on the Key Peninsula. 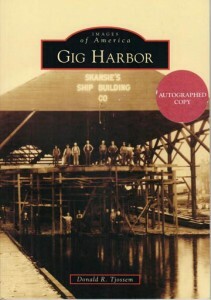 Images of America: Gig Harbor Using archival photographs, the Images of America series celebrates the history of neighborhoods, towns, and cities across the country. 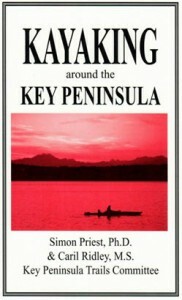 Kayaking Around the Key Peninsula This guide by Simon Priest, Ph.D. & Caril Ridley, M.S., of the Key Peninsula Trails Committee, describes a 40 mile marine trail with 14 legs between 15 points of interest during a paddling journey around the Key Peninsula. 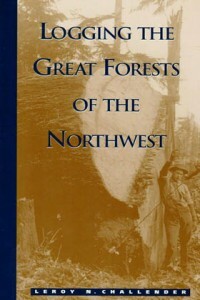 Logging the Great Forests of the Northwest In 1927, author LeRoy N. Challender's family moved to Vaughn. 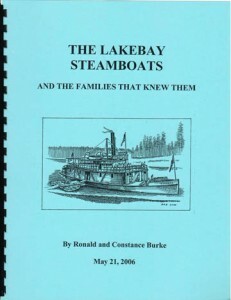 He built his home on the Key Peninsula in 1950. 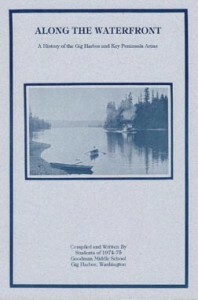 LeRoy had to commute over the years to Bremerton, Seattle, and Tacoma to earn a living. 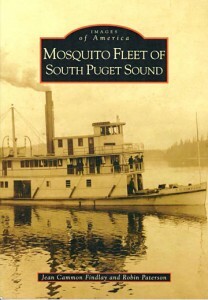 Mosquito Fleet of South Puget Sound In this Images of America series, co-authors Jean Cammon Findlay and Robin Paterson use archival photographs to present distinctive stories from the past that shape the character of the community today. 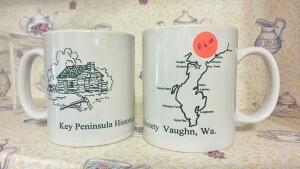 Key Peninsula Historical Society Logo Mugs Coffee and tea drinkers can proudly display their support for the Key Peninsula with these fashionable KPHS mugs. 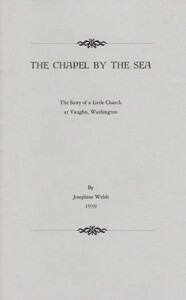 The Chapel By the Sea Enjoy the story of a little church in Vaughn, Washington. 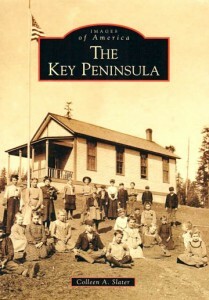 The Key Peninsula This book by local author Colleen A. Slater is another of the Images of America series, which celebrates the history of neighborhoods, towns, and cities across the country using archival photos and authentic stories. 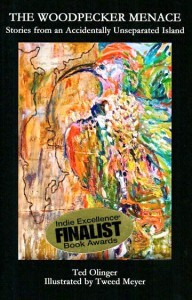 The Woodpecker Menace These stories from an "accidentally unseparated island" are brought to you by author Ted Olinger and illustrator Tweed Meyer. 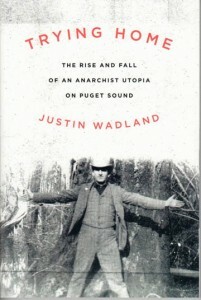 Trying Home Local author and UW Tacoma librarian Justin Wadland tells readers about the rise and fall of an "anarchist utopia" on Puget Sound. 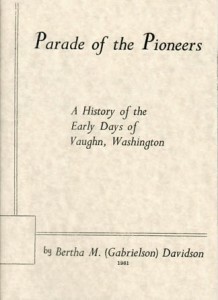 This true story traces the history of Home, Washington, from its founding in 1896 to its dissolution amid bitter infighting 25 years later. 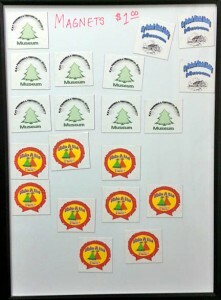 Please visit the museum to purchase. 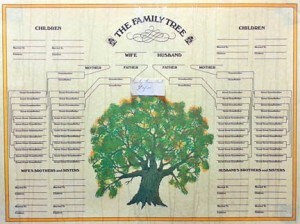 For distant friends and relatives, shipping can be arranged (contact us by email to make arrangements). We now accept Paypal. 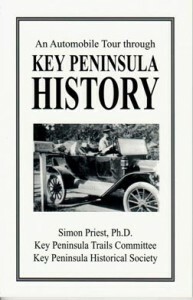 Or, visitors can make checks payable to: Key Peninsula Historical Society (KPHS).